Are you looking for a big trout to put on the wall but you don’t have a boat big enough to make long boat rides or handle heavy seas? Well I have a place right up your alley if so. The Florida panhandle is a small boat owners dream especially if you are looking for gator sized trout. There are many great things about fishing Florida with the first being free boat launches everywhere you go. On top of all the launches being free they are spotlessly clean built with beautiful concrete ramps and are always well maintained. My favorite part after launching is the distance of the boat ride. No matter what direction you decide to steer your vessel in hopes of landing a monster trout a distances traveled from the ramp you choose should be no more than two or three miles. If you find an area further away that is producing better well all you have to do is launch a little closer next time as these free launches seem to be every 5 miles on the road. 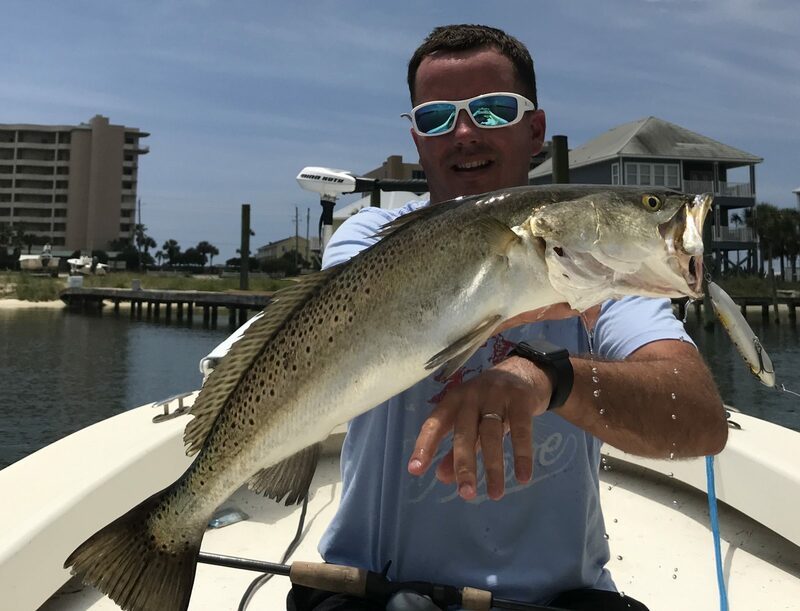 The Florida waters have so much land protection from the wind and the big trout do not seem to be that picky on where they roam as long as there is some grass beds around. Just play the winds and find grassy bottoms. If you are fishing a hard north wind simply focus on a shoreline protected from a big north wind and the same goes with the other three wind directions. Use google earth to view the layouts of the estuary as with the clean water around it is very easy to find grassy bottoms using mapping from google. So now you know to simply target leeward and grassy shorelines now here is how to catch them. No doubt the absolute best way is daylight and topwater. We use the Matrix Mullet exclusively and have yielded more 25 Plus inch trout to count over the last few years. From 5am till 7am is your window of opportunity. Sure we catch several trout once the sun comes up on matrix shads and suspended jerk baits but the monsters always seem to bight at the crack of dawn and they simply love topwater. The evening bite can be solid too and the best part about the evenings is that if you struggle simply hit a few dock lights on the way in with a Matrix Shad. Do not expect to catch typical night light school trout either. Florida’s dock light trout average 16-20 inches and I have personally caught them up to 24”. The areas we fish are from Orange Beach, Alabama all the way to Destin, Florida in the Choctawhatchee Bay. These areas have waters of pure salt and monster trout. Patience is the key as non stop action is simply not going to happen. An average morning is around 5 trout with one or two being over 22” and a great day is 10-15 trout with your best five trout weighing 25lbs. If you are a big trout enthusiast and you like going to the beach for vacation you better bring a rod and a topwater with you. Wade fishing, kayaking, and even simply off the bank will get the job done. Make sure to watch all our DockSideTV episodes on fishing big trout on the panhandle.